Looking for Web Hosting Hub promo codes and coupons? #MasterTheWeb and save money today with our exclusive The Webmaster offers. This is a great coupon that gives you $3.99 each month off shared hosting when you sign up for 3 years. Click your chosen coupon or deal above. This will take you direct to their website and activate the offer. To proceed, click the Get Started at the bottom of one of the plans shown on the front page (you will have to scroll down the page a little to find it). You can the link on the screenshot. 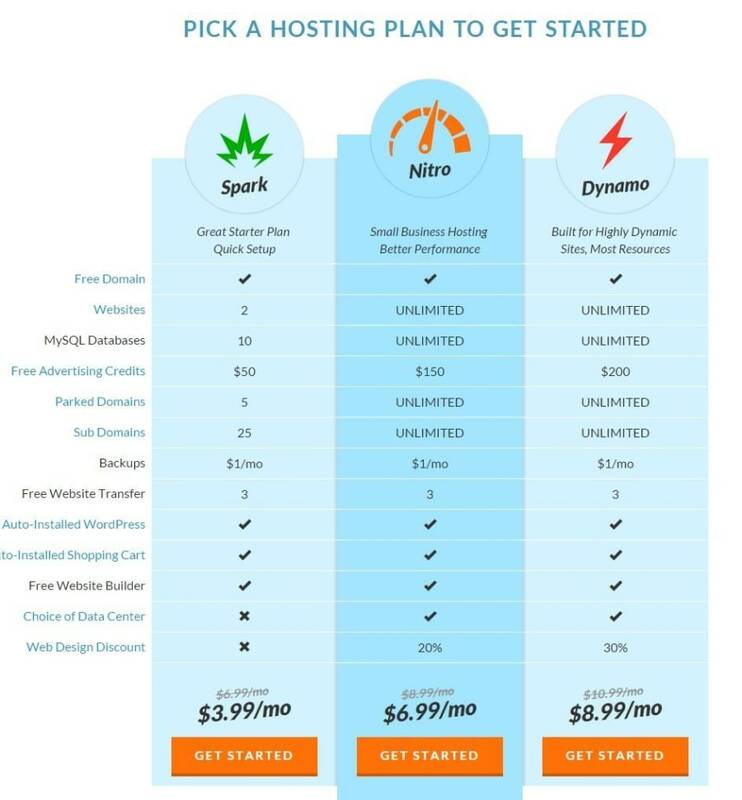 As you can see, the Web Hosting Hub promo code applies to each of the three plans. The next stage is to enter your domain information. 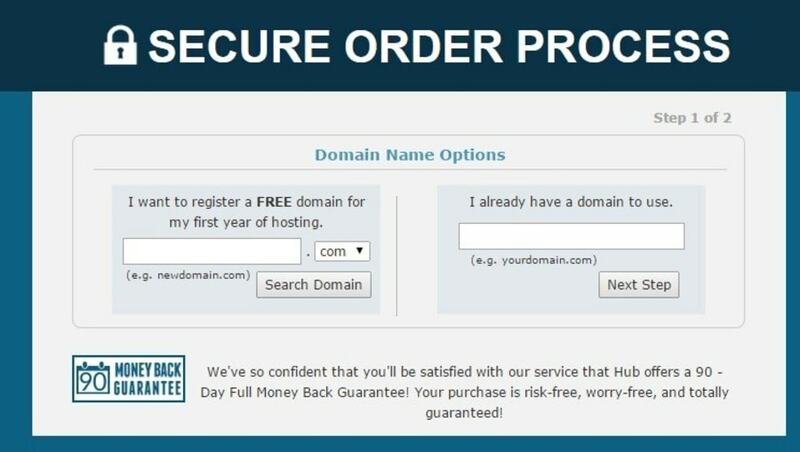 With all their plans you are entitled to a free domain, but you should note that any free domain is not included in their money back guarantee. If you already have a domain, and simply wish to point that at the server then fill in the box to the right, and click next step. If you want to register a new domain you should complete the left box to choose your domain. The second part of the order process deals with your details, add-ons, confirming plan choice as well as entering your payment details. Dealing with each of these points separately (even though it is all on the same page) the first part is to enter in all your personal details. The next thing to do is to choose your add-ons. If you choose the basic plan, there will also be an Upsell to try and get you to go “Nitro”. You will find that if you go with the add-ons, and go Nitro, this budget brand starts to become quite expensive, and as a result even with the discount it may not be the most cost effective hosting solution, especially when it comes to renewal when you won’t have the benefit of our Web Hosting Hub Coupons. Choose Addons © The Webmaster. You can elect to have either WordPress or PrestaShop preinstalled. In any event, they use Softaculous, so you can install these and many more easily yourself with just a few clicks, and you will have full control over installation details such as user and password etc. Therefore, we recommend you do this yourself once the hosting account is setup. The final stage is to enter your payment details and confirm agreement to the terms and conditions. Note that you can only purchase hosting using Visa, MasterCard, Discover or American Express. PayPal or other payment methods are not available. Also note that they will automatically charge you again at the full rate at the end of the initial term, which we don’t really like, so you may want to bear this in mind. You will also note that the cost is more than you anticipated unless you sign up for three years. Also, there is no monthly payment plan. Can you advise which hosting plan I should purchase?? Without knowing your exact circumstances, such as traffic, website features and configuration it is difficult to know what to recommend. Each plan comes with an increasing amount of resources, with the Spark plan being limited to just two domains. If you have a lot of traffic or features that use a lot of resources (i.e. e-commerce or filterable options), then we would recommend the Dynamo plan. Am I able to pay monthly, rather than for a longer period? No, they do not offer monthly payment plans at this time. Does Web Hosting Hub accept Bitcoin? Web Hosting Hub does not accept Bitcoin at this time. If paying by Bitcoin is essential, then we suggest Namecheap.